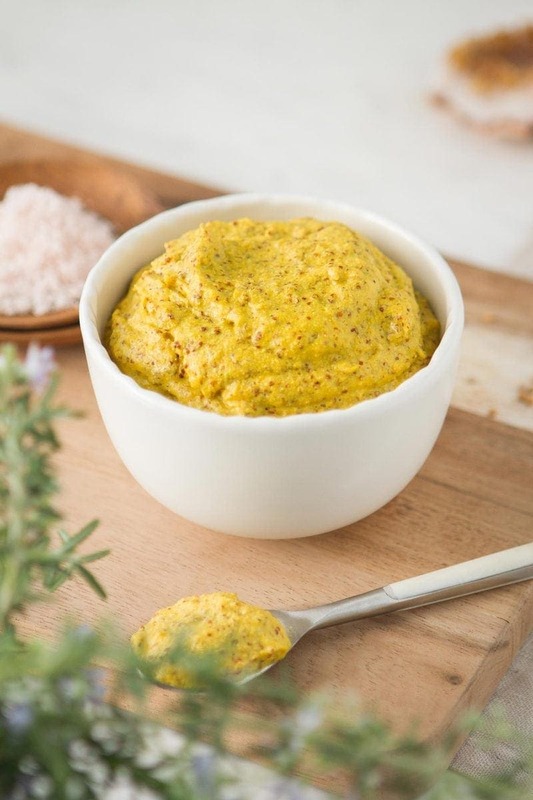 A simple raw homemade mustard recipe that uses both yellow and brown mustard seeds. Spike it with turmeric for some extra antioxidants and anti-inflammatory action. Mustard is a classic tonic for the digestive system. I’ve been musing this last week on all the incredible medicinal and botanical recipes I made as part of a Shamanic Herbal Apprenticeship I took part in, a few years back. We made herbal infused oils and vinegars, soups infused with wild weeds and medicinal herbs, homemade sauces, herbal pestos and spreads, a variety of dishes using locally harvested seaweeds, and of course, all kinds of fermented and cultured goodies. Those musings have certainly influenced the next few blog posts. Oils and vinegars are such great carriers for herbal, medicinal foods. Once infused, they can be used to add a little dose of therapeutic goodness into your daily fare. I’m starting with a homemade mustard today, which, as a pungent spice, is a classic tonic for the digestive system. I also have what will eventually be a herbal mead on the counter, alongside a lovely bottle of apple juice slowly transforming itself into apple cider vinegar. These are things I will share in the near future once they have matured. 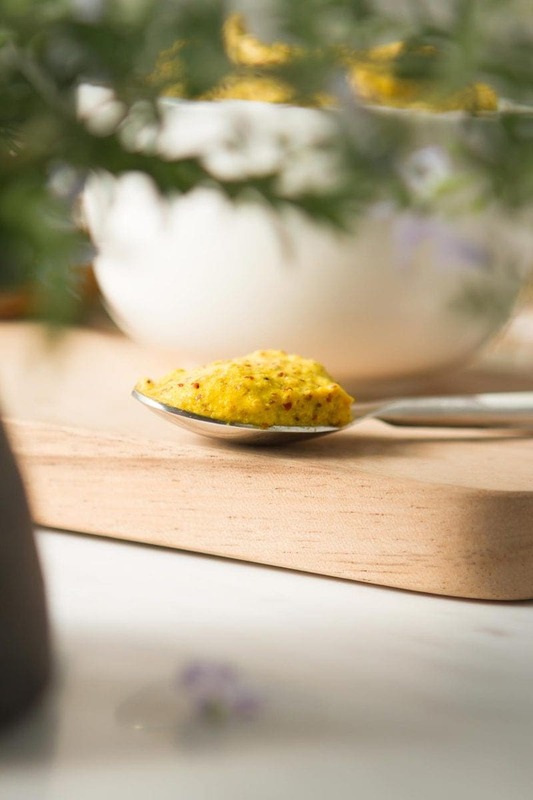 This is a divinely simple recipe, spiked with a little turmeric powder to add both colour and antioxidants (yes, yes – I am obsessed with turmeric – more on the benefits here!). The yellow mustard seeds are the mildest in taste, black are the hottest with brown somewhere in between. I have used a combination of mostly yellow with a little brown. 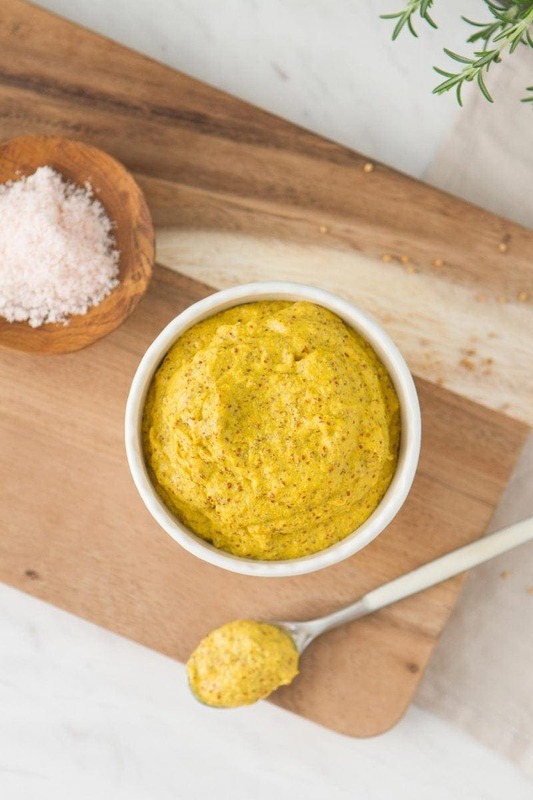 Once you have whipped up the mustard, you can blend in some complimentary herbs and spices for extra flavour. Some ideas – roasted garlic, cumin, shallots, fennel, rosemary. 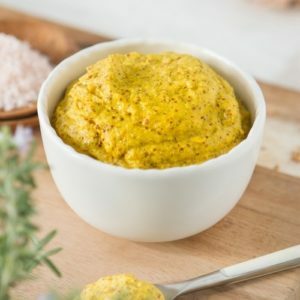 Mustard is part of the cruciferous family of vegetables, keeping company with the likes of broccoli, cauliflower, Brussels sprouts, cabbage and kale. The cruciferous family contain protective compounds called glucosinolates. 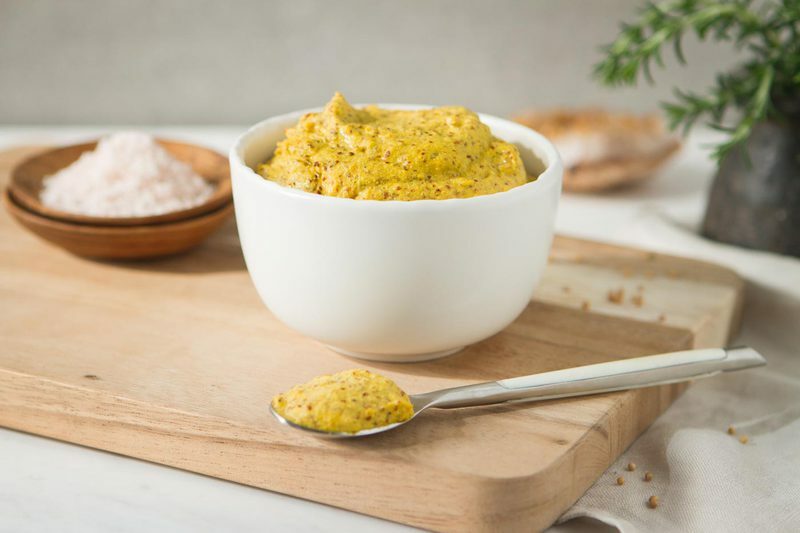 The pungency of mustard seeds is actually from a highly bioavailable by-product of the aforementioned glucosinolates – allyl isothiocyanates (AITC), produced when the seeds are broken or soaked in water. AITC exerts antimicrobial activity against a diverse spectrum of pathogens. It has also attracted attention in literature for its anticancer activity (these are based on studies conducted on cultured cells and in animals)[1, 2]. Interestingly, this compound is metabolised and eliminated via the urine, and high concentrations can be found in the bladder. Consequently, numerous studies have found it particularly effective in inhibiting bladder cancer development [3, 4]. 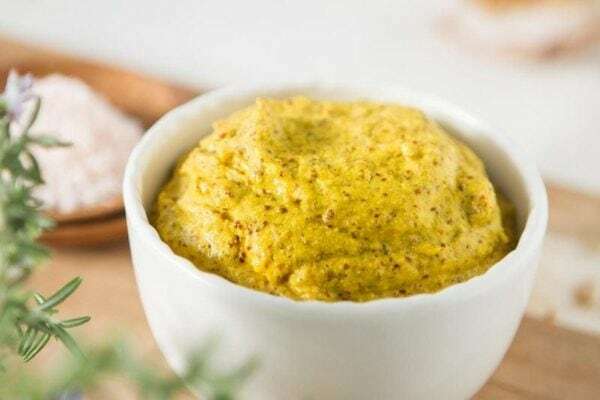 Raw homemade mustard spiked with turmeric. Yields approx. 1.5 cups (24 tablespoons). Please note the active prep time excludes the 24 hours needed to soak the mustard seeds. Depending on your preference, you may like to add more sweetener.